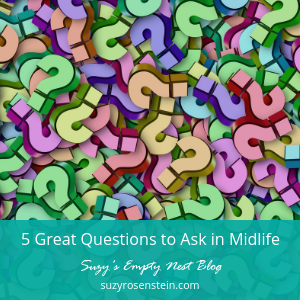 What’s going on up there in your midlife brain with all these questions? So many things related to negative spin! And the problem is, these questions are not all in your brain with your permission. Let’s take the questions you ask yourself on a regular basis. When will I finally exercise? The thing about a question is that…the ANSWER is the thought you’re thinking. And when you answer questions like these, the answers typically don’t make you feel great. -Because I’m not the kind of person who follows through. -Because I’m a lazy person. Instead, you can learn to think better thoughts which will have better answers, and produce feelings that are more useful. Here are 5 great questions to ask yourself, on purpose. 1. What do I love about myself? 2. How can I make losing weight more fun? 3. What if I’m the perfect age to be doing this now? 5. How can I make sure I don’t have regrets? Just some thought-starters for you. You can see, though, that the way you ask yourself a question can create different thoughts for you, and therefore, different feelings and ultimately different results. You will prove your thoughts. That’s just the way things are. So you might as well think more on purpose, right? 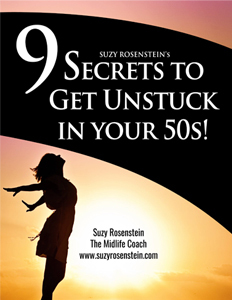 Want more help supervising you beautiful midlife mind? Maybe you’re totally ready to finally do something about feeling so stuck? Get in on the secret! Grab this powerful free download now!